Is it time again again to bring up the topic of New Year resolutions? I have never really been a big believer in New Year resolutions. In fact, I don't really give much about the New Year fuss itself, as my life does not happen in 365-day-slices. There is projects that take longer or shorter than this. That's how I count my life. However, I was just checking my blog posts from a year ago to see if I had any New Year resolutions that I could recap now. In fact, I had!!! Even food blogging related: I wanted to improve my food photo skills in a way that they would be accepted at Foodgawker etc. 360 something days later I can proudly say I have succeeded. Honestly, I think I learned a lot about how to shoot food in an aesthetic and appetizing way. And I can proudly say, it's all self-taught. Or in a more down-to-earth-way: I learned from my mistakes. One other New Year plan was running my first ever full marathon in 2010. Unfortunately, that didn't happen as I chose a too fancy place. And out of purely logistic reasons we couldn't go there with the whole family at that time of the year. I had to cancel it 2 months in advance. Now what is the New Year supposed to bring if I had three wishes? Well, I registered for the Dubai marathon which is on 21 January 2011. I can almost walk to the starting line, so nothing will stop me to get there. I hope I will complete this race (first wish), and I hope I will finish it in a good time (second wish) for a first-time marathon. And otherwise, I just want my family, friends and myself be happy and fulfilled with whatever we do or aim to achieve (third wish). Alright, all this being said, how am I gonna turn the subject to the actual recipe of this post, Garlic Green Beans? Perhaps, another New Year resolution for 2011 should be to improve my writing skills. I sometimes feel that my posts read a bit like a bumpy road, but I don't have the patience or creativity in me to change that on the spot. I should work on that. I don't think there is an elegant way to turn the conversation from New Year resolutions to Green Beans. So let's forget about that and let's just talk about the Green Beans. It's been one of my favorite side dishes over the last few weeks for several reasons. It's cooked in 5 minutes. It's full of color. It's full of flavor. 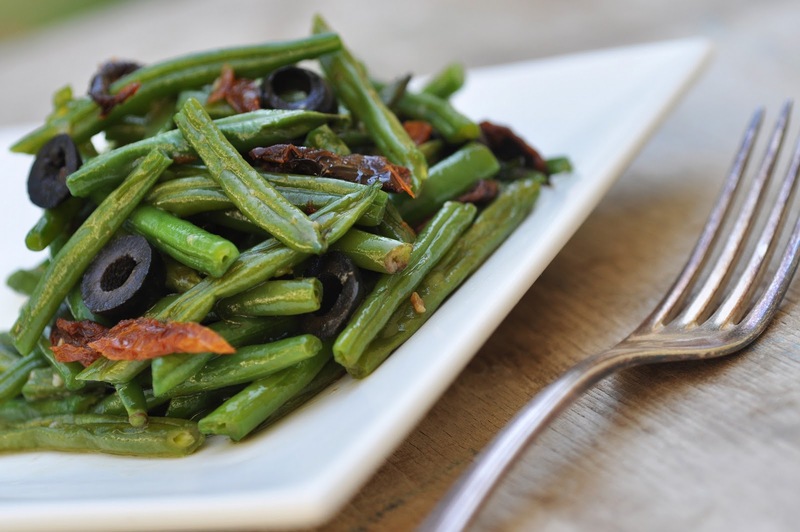 I love the combination of garlic and green beans supported by salty olives and tart sun-dried tomatoes. It is a great side dish to any grilled meat or fish. Or if you want to go vegetarian (in this case even vegan), have it on top of brown rice, bulgur wheat or buckwheat. Place sun-dried tomatoes in a small bowl. Pour boiling water over them and let stand while preparing the rest of the dish. In a large pan (that can be covered with a lid), heat olive oil over medium heat. Add minced garlic and cook for a minute while stirring constantly. Make sure the garlic does not get burned. Add the green beans to the garlic oil and cook for another 2 minutes or so. Season lightly with salt. Add 4 tablespoons of water, put on the lid, and increase heat to medium high. Let cook for 2 minutes stirring occasionally, until beans are tender. Take off the heat. Drain the tomatoes. Cut into slices or chop. Add them along with the olives to the green beans. Transfer to serving bowl. Serve immediately.